Can Sports Betting be beaten??? Read rickjshandicappingpicks.com to find out the answer!!! Betting is 55% on the dog Memphis with the line moving from -3.5 to -6.5-110. Models clearly favor Memphis. Variables are Neutral. Public betting slightly favors W. Kentucky. 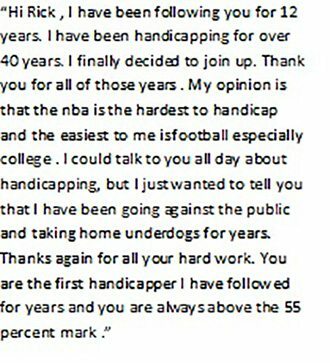 If you have been following this site long whenever greater than 50% of the betting is on the dog its a read flag to either look at the favorite or stay away from the dog. I see no reason to treat this game any differently even with the models pointing to Memphis. So I am passing on the game tonight. Monday we had 4 one unit plays and went 2-2. In College hoops, we won with St Francis +29 65-78 and SE Miss St +11 78-81 and lost with Delaware St +34.5 56-103. In the NBA we lost with Phoenix +6 108-115. Today I have sent out 1 one unit play so far. It seems like we are having 4 or 5 plays a day except for weekends where on Saturdays we can get anywhere from 7 to 10. But of course, we still have 12 days left so plenty of time to get to +13! I have been getting some questions on the 3-day free trial and how it works. 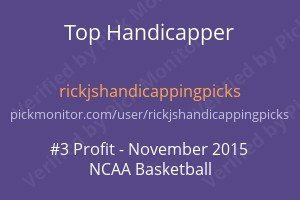 All you need to do is follow rick_sports and I will give you a 3-day free trial. The plays are sent out via a private twitter feed. So you can have they to your phone or check twitter. The plays typically go out in the Morning for the NHL and for spread betting shortly before game times.